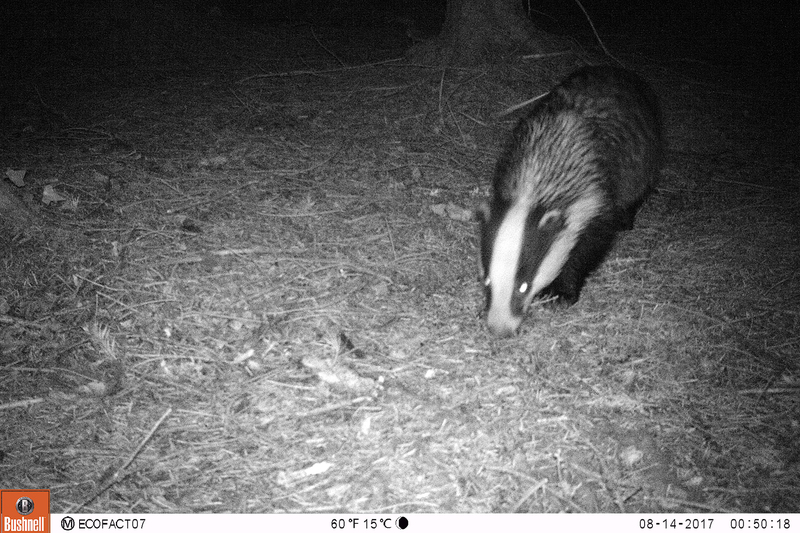 We recently undertook a survey of badgers in a coniferous forestry plantation in advance of proposed tree felling works. This video was taken using a Bushnell Aggressor trail camera. In Ireland, Badgers are protected under the Wildlife Act (1976, 2000) and are also listed under Appendix III of the Bern Convention. Badgers are highly capable diggers and almost always excavate their own setts. Several setts will be present within a badger group’s territory but the focus of the badger group is known as the ‘main’ sett. The main sett is situated roughly central within the group territory and is usually occupied throughout the year and used as the principal breeding sett. An active main sett is characterised by considerable signs of activity, such as bedding, nearby latrine sites, and well-used paths. A main sett might occasionally just have one or two entrances, but more typically, it will have numerous entrances and chambers. Large soil heaps outside the sett entrances are indicative of a large underground tunnel and chamber system. Other setts within a group’s territory are usually smaller and only used intermittently or seasonally. A very large main sett can possess 300m of tunnel and 20 or more chambers. Setts are often utilised by generations of badgers and may be enlarged each year, and collapses can occur too. The size of the sett is not indicative of the number of badgers present. In Ireland, with its relative lack of woodland, many setts are situated in hedgerows, and sett size is then constrained by the habitat available. For further information on badgers see this page from the Vincent Wildlife Trust. Our company provides a range of terrestrial mammal surveys and assessment services for all mammal species in Ireland, including bat species, badger, otter, pine marten among others. For further information on the range of non-volant mammal and bat surveys and assessments we provide please see the following links. Also, please contact us now if you have a requirements in relation to protected mammal surveys and assessments.